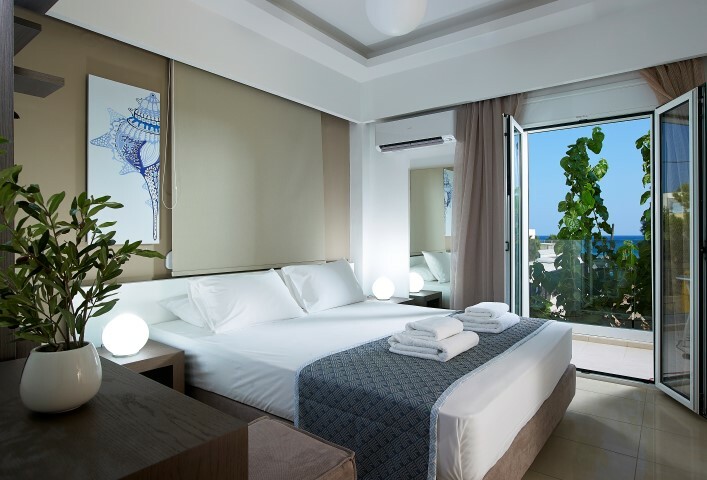 Coral Apartments, recently and fully renovated with overlooking to the Libyan Sea, is located 300m from the center of Ierapetra and 30m from the beach. With free public parking next to the open-air gym where the guests can exercise or practice in sports individually or in groups, with an easy access and a short distance from all the sights and the crucial points, Coral Apartments is the best choice for both leisure tourism and business trips, operating all year, in a distinctive luxury and comfortable stay. All apartments feature, anatomic mattresses with King Size beds and single beds of Candia Strom ®, free Wi-Fi, qualitative household appliances, air condition, TV flat screen 32' with satellite and digital channels, free safe box, iron, ironing board. The kitchen is equipped with fridge, electric kettle, ceramic cooking hobs, microwave, toaster, coffee machine, teapot and cooking hobs. In a very short distance is the Bus station ( KTEL) and every Saturday the local street Market where local products are sold by the producers of the area and surrounding villages.